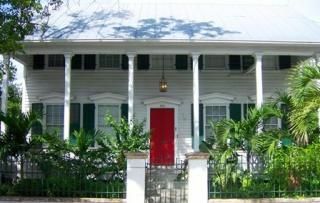 Enjoy one of Old Town's wonderful Key West vacation rentals.This is a classic four bedroom, four bath 'eyebrow' style home located in historic Old Town Key West that is just 1 block of Duval Street and a short walk to Harbor Walk & Mallory Square. This home has a large living room and dining room with a kitchen that overlooks your own patio. Lush foliage surrounds a private swimming pool and hot tub. We vacation as a family every couple years. This year was one of those excursions. Family come from around the US to gather and enjoy each other's company. Casa Rosa was an excellent property to convene our group. The private pool, location, cleanliness, and amenities will not be beat. The home was large enough to spread out and have a little privacy. Plenty of bathrooms so one doesn't ever have to wait. I want to thank Mary for this wonderful memory and her assistance in getting our needed baby rental equipment. Casa Rosa is in a great location and has awesome amenities. It's a great value and provides all the comforts of home. I would recommend it to everyone I know...and have. I've stayed at Casa Rosa 3 times and plan to again on my next trip to Key West. There's no reason to stay anywhere else! Overall the place was great. It was very spacious and the kitchen was much better than the pictures indicated. It has everything you need and the location is great. You can walk to everything. The best part is the outdoor space and pool. As other people have mentioned it is very noisy. It didn't bother me but I live in the city. I listed it as four stars because the fourth bedroom is very tiny. Essentially it fits the full bed a bedside table and nothing else. It would be tough for two people and there isn't a place to put your clothes. Mary was very accommodating and let us leave our bags there since we had a late flight. I'm glad you enjoyed staying at Casa Rosa. There is the hustle bustle of Key West at the front of the house and the tropical escape poolside at the back of the house - something for everyone to enjoy. The fourth bedroom is small but has a closet (behind the bedroom door) for storage. This large home also has two king bedrooms and a queen bedroom as well as four baths. Casa Rosa is a large eyebrow style home built pre 1882 and one of about one hundred remaining eyebrow homes in Key West. This was an exciting time in Key West when this historic old town area housed Hemingway and his pals. We look forward to seeing you again. First let me start with the good. We were looking for a place that was located near Duval and would allow us to walk and explore all the excitement of the city. Casa Rosa was exactly that. But with that location comes the constant noise of being located on a busy road a block from Duval.-you can clearly hear every thing outside, from sidewalk conversations to the traffic and motorcycles, and that noise goes on all night long.. and every noise echos through the house. The pool in the back is a nice escape where you can ignore the hustle and bustle going on all around. Be aware that the house is in need of major maintenance and a deep cleaning. Deep Dust on ceiling fans and louvers and kitchen screens as well as other surfaces and a black coating on the porch and porch rails and residual dirt on floors that eliminated the option of going barefoot. The living room furniture is frayed and probably needs to be replaced. The electric outlet in the master bath didn't work. I spoke with Mary before we left and told her of the issues. She assured me that she would be checking on the things I mentioned above. Also - you might want to find out if the upper floor apartment is rented out during your stay -- the additional noises from someone walking around overhead might be a concern for you. Luckily no one was there during our stay. We overall enjoyed our stay -- street noise should be expected (but it's a lot). Cleanliness and maintenance should also be a priority. That was probably our biggest disappointment. Great location, very nice house! Our four-adult family had a great time staying at Casa Rosa. The location can't be beat, we walked nearly everywhere we wanted to go, including Yoga on the Beach most mornings. The bar hoppers did not have far to go to get home in the early hours either. The house is quiet enough, considering location on busy street. Everything you need is supplied, even beach towels for the pool/hot tub. The house was very clean. It is a four bedroom house and two of the rooms are very private. However, the fourth and smallest bedroom looks like a converted porch and is accessed either through a larger bedroom or through a bathroom. Just something to keep in mind if several couples are planning to share the space. Games, puzzles, and books are available and there are lots of TVs, though we never turned on one. I should also mention that the parking spot is not very large. We squeezed a small SUV into it, but it made access difficult for the upstairs (separate apartment) guests. We had a wonderful time in Key West and hope to visit again! We would definitely stay in Casa Rosa a second time. Your trip to Key West sounds like a huge success. I'm glad Casa Rosa was a hit with your group. It is such an important piece of the history of that popular area of Key West. It is a good mix for everyone - you can be out and about or just relaxing poolside in your private and tropical yard. I wish I had known about the van because I could have helped you with a different nearby parking space. We look forward to your return to Casa Rosa. Classic Key West style and charm with tons of room! I cannot say enough good things about this home. First off it’s a huge property. We had 3 adult couples and had plenty of space for everyone. The pool and hot tub were great for relaxing. The location is ideal with easy access to Duval and the waterfront. Mary, the property manager, could not be sweeter. We had an issue after check in that she swiftly attended to and made sure our stay was great. The only drawback to this location is it is quite loud. It didn’t really bother us but if you are someone who needs quiet when you sleep, this may not be the house for you. Overall for the price this house can’t be beat! So glad to hear you had a great stay at Casa Rosa! The location just one block from Duval and only a short walk to Mallory Square, Harbor Walk, and the beach is indeed ideal and the tropical yard with pool and hot tub is a nice get away for relaxation. It is always nice to have comfortable space to gather when you are on vacation and I'm happy to hear that Casa Rosa suited your group. We look forward to seeing you again. Casa Rosa is one block off the famous Duval Street and just minutes away from sites such as Hemingway House, Mel Fisher's Museum and the Lighthouse! This location is perfect for a beautiful evening stroll along the harbor, and is very close to many restaurants and shops. Or stroll down Mallory Square for beautiful sunset celebrations!